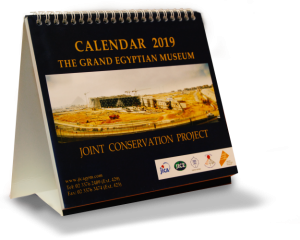 The Grand Egyptian Museum (GEM), mainly to be housed and exhibited ancient Egyptian collection, is targeted to be one of the greatest museums in the world, so that several departments under the GEM -including the GEM Conservation Center (CC) – has already be active to achieve this target. In this context, GEM-CC has officially stated and developed its “Objectives” with the “Strategic Management Plan” for 5 years. JICA already has made the first step supporting a “Study Visit to Singapore” in September 2012 as a part of the project. Then, the first plan of “Management Structure” and “Key Performance Indicators (KPI)” were revised through the two workshops in February 2012 and November 2012. The Plan including KPI was launched officially in March 2013 and since then JICA has implemented 2 follow-up workshops in May 2013 and in March 2014 to monitor the progress and changing situations. JICA HQ representative: Mr. Yodo Kakuzen (JICA HQ). Members of JICA GEM-CC Project (including Japanese Experts and National Staffs). Representative of Operational Management Consultant (OMC) for GEM: Mr. Charalampos Chaitas (Director of OMC). Re-confirm the mission of GEM-CC and update items and achievement of KPI targets under the current situation around GEM-CC. Update items and targets of KPI by confirming the mission of GEM-CC. Identify the necessary actions to achieve KPI in 2015 and objectives of GEM-CC as well as to plan transportation, conservation, exhibition for the partial opening of GEM. Review the Strategic Management Plan of GEM-CC to confirm its significance and also identifying important issues and necessary actions for the effective management of GEM-CC. Check the progress and results of transportation of artifacts to be housed in GEM. Clarifying the obstacles and finding ways to overcome them. As an output for the workshop, some important points were decided such as: 1) publishing the GEM Annual Report in the website, 2) having monthly meetings (to check the progress) between GEM and JICA and 3) holding half-yearly workshop (to review the management plan and objectives) according to JICA recommendations. Considering the importance of partial opening of GEM, the major indicators concerning transportation, conservation and registration of objects into 3 sub-categories (Tutankhamun, Large and Others) respectively. And targeted numbers of these indicators for 2015~2017 were revised and these numbers will be monitored. Next workshop will be held in October, 2015.